What happens to my Freegal music when I update my library card? - Ask Us! Q. What happens to my Freegal music when I update my library card? If you use the Freegal app to to download and play songs on a tablet or smartphone and you get a new library card number, you will need to transfer your songs through iTunes. The Freegal Music mobile application stores the files for the downloaded music in a folder that is associated with the Patron ID or Library Card Number. This is why, when signing on with a new Patron ID / Card Number, you will no longer able to access your music. Before transferring the songs, sign in to the Freegal Music mobile application using the new Patron ID. Download a song. This will ensure a new folder is created for the new Patron ID. 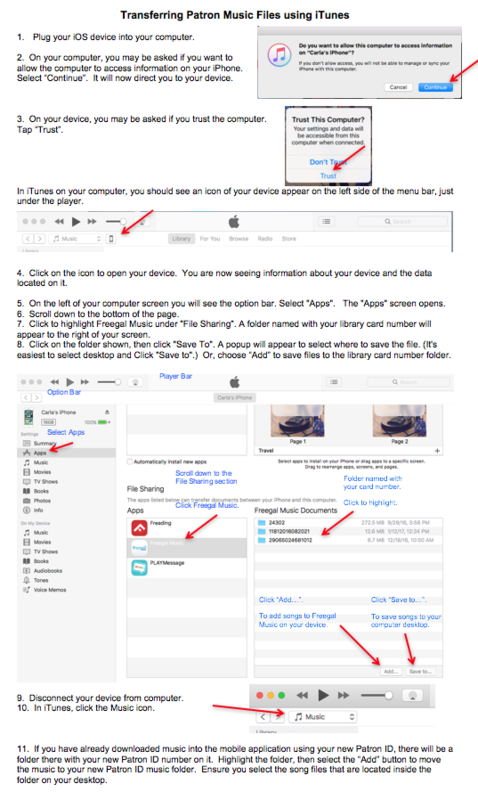 Using iTunes, you can access the folder and place it on your computer desktop. Then, after logging in to the Freegal Music mobile application with your new Patron ID, you can move the music from the folder on your desktop into the folder that is on your device. 1. Plug the iOS device into the computer with a USB cable. 2. After "trusting" the device in iTunes, an icon of the device will appear on the menu bar. 3. Select the icon of the iOS device. 4. In the Navigation Pane on the left of the screen, beneath Settings, select Apps. The Apps screen will appear in iTunes. 5. Scroll down to the lower part of the screen, in the File Sharing section select "Freegal Music". 6. You will now see folder(s) on the right side of the screen, in a section titled "Freegal Music Documents". There will be a folder named with the old Patron ID number. 7. At the bottom of that section there are two buttons, "Add" and "Save to". Select "Save to" and save the folder to your computer desktop. If you have already downloaded music in to the mobile application using your new Patron ID, there will already be a folder there with your new Patron ID number on it. Highlight the folder, then select the "Add" button to move the music to your new Patron ID music folder. Ensure you select the song files that are located inside the folder on your desktop.